Possibly not for the dedicated locavore, but I found this a good way to bring tomatoes to the table in winter— as the little ones taste the same to me in any season. This is a light, cheery, and to me, easy to make warming winter meal. Arrange the shelves in the oven to make room for the baking dish with the chicken and the baking pan with the tomatoes to go in together— I put the chicken just below the middle and the tomatoes and garlic just above the middle. Get the oven going at 400°. Put as many cherry tomatoes and peeled garlic cloves as you want in a bowl. Toss with a little good-tasting olive oil, spread this out on a baking sheet and sprinkle with some sea salt flakes. Place the chicken breasts in a baking dish and sprinkle with salt and fresh cracked pepper. If the baking dish doesn’t have a lid, cover with foil; I use an 11 cup Anchor Hocking baking dish with a glass lid which is good for up to four not too big chicken breasts. Put everything in the oven and pour yourself a glass of something. The tomatoes will take around 30 minutes to shrivel up and get some brown spots. I usually just leave the chicken in until everything is done, but you can test it around 20 minutes; if it looks cooked through when you pierce it with a knife or the instant read thermometer says it’s 165º, it’s done. 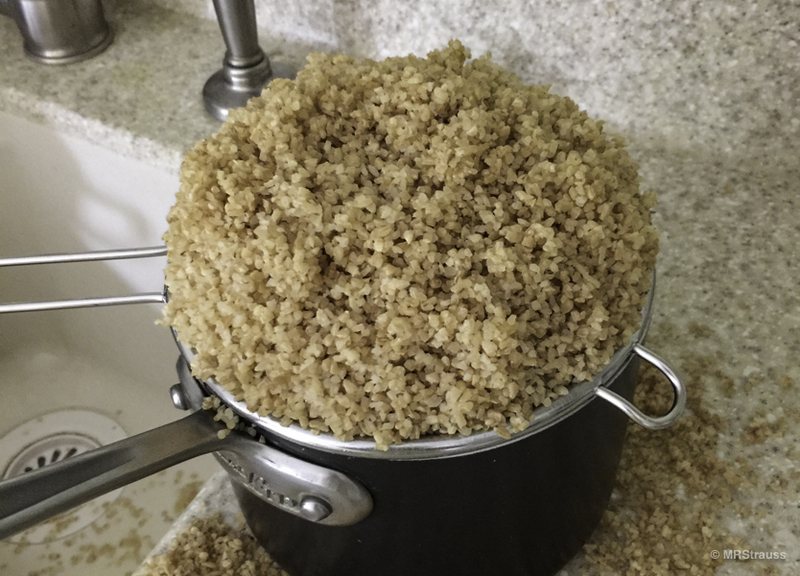 You can take it out and let stay warm on the stove. While you’re sipping and the tomatoes are roasting, start a pot for your orzo and bring it to a boil; salt the water if you wish. Orzo usually takes 10 minutes, so try to plot for it to be done when the chicken and tomatoes come out. While you’re waiting, finely chop some parsley for the orzo, drain a few spoonfuls of capers, and have some lemon wedges ready— I take out any pips that I can see. Oh, and you can set your bowls on the stove to let them warm up a bit. When the tomatoes and garlic are shriveled up and brown in spots, it’s ready. Drain the orzo and put it back in the pot; drizzle with some olive oil and fold in the parsley and maybe some salt. Take the chicken and tomatoes out of the oven and slice or dice the chicken in the baking dish or on a cutting board. Now it comes together: every bowl gets some orzo, a few slices of chicken, tomatoes and garlic. Then I finish the dish with a few capers and a splash of lemon juice, but it tastes just as good without— the roasted tomatoes are the star of the show here. This might work with fish, maybe tilapia dredged and pan fried. The orzo could be any small pasta (little shells with fish could be nice) or even rice, quinoa, or couscous. For olive oil, I use Columela— it has a sort of spicy flavor, for sea salt flakes, I use Maldon, and for pepper, I use the Tellicherry variety. I use table salt for anything mixed in or cooked and save the sea salt flakes for finishing or roasting. Using these ingredients adds a little extra flavor to the dish and they’re getting much easier to find now. I’m wondering about the salt packed capers I see popping up, but they are super expensive. I guess I should try them. 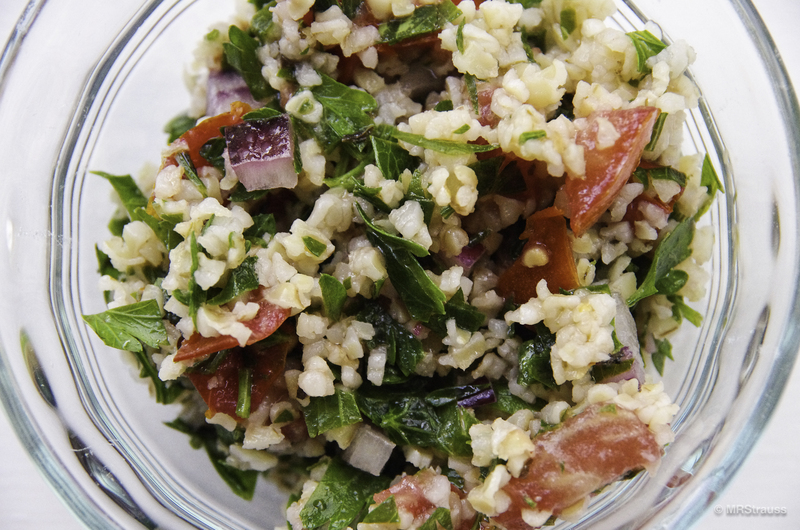 This dish could also work with quinoa or maybe even white rice. Update February 2016: I made this with quinoa instead of orzo and I like it just a much. 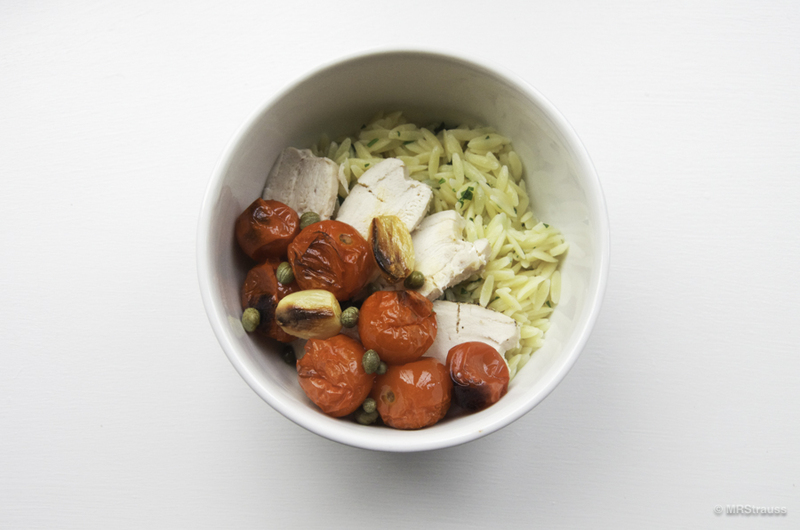 This entry was posted in Bentosh and tagged Bentosh, Chicken, Orzo, Tomatoes on February 16, 2015 by mrstrauss.